The clear-out of Cardiff's city centre in the early hours of a Sunday morning is a standard occurrence, a weekly by-product of a city's love of a night out. But this weekend it will be runners, not revellers, who account for the mass sweep of the streets. The Cardiff Half Marathon will have a record 21,124 runners taking part on Sunday, cheered on by more than 50,000 spectators. And with the World Half Marathon coming to Cardiff in 2016, Wales is aiming to become a globally popular destination for elite long-distance runners. The Cardiff Half Marathon has grown rapidly, with this year's number of participants almost double the 10,818 who took part in 2011. The standard has risen sharply too, with the winning time decreasing in each of the last three races. While mass participation and raising money for charity are important elements of the race, former marathon world record holder Steve Jones believes it is the stellar athletes and tumbling records which really draw the crowds. "I still think the elite drive the train," the Welshman says. "Whilst they're driving the train, they're pulling a lot of other guys behind them to better themselves." Jones still holds the British marathon record, though Olympic hero Mo Farah has that landmark in his sights having moved up from long-distance track races to the marathon. Since Jones set his record of two hours, seven minutes and 13 seconds in Chicago in 1985, the pace has increased at a frightening rate and the current world record - set by Kenya's Dennis Kimetto in Berlin last month - is now 2:02:57. "It's a bit scary. I'd be a mile behind them," Jones says, laughing. "It's good to see the sport moving forward. I wish it was a British guy doing it, as we all do I'm sure. Our time will come. "Mo Farah has all the tools to run sub 2:05, maybe sub 2:04. I'd like to see him do it. He'll be the British record holder for history then." Cardiff Half Marathon race organisers are hopeful of attracting the likes of Farah in the future, as the Welsh event aims to close the gap between itself and the Great North Run. Farah set a new British half marathon record of one hour exactly at last month's Great North Run, and Cardiff organisers hope a runner of his status would help elevate their race to new heights. 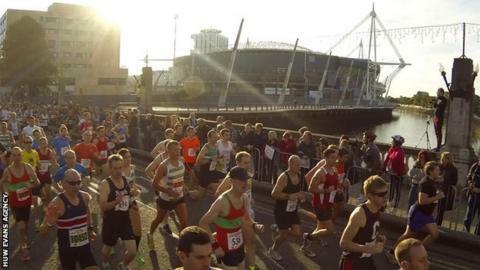 Last year's Cardiff Half Marathon had 14,269 runners, and there will be 21,124 this year. "Next year our goal is to make sure it's televised live and get the likes of Mo Farah to run it," says Cardiff Half Marathon chairman Nigel Roberts. "We are targeting to become bigger than the Great North Run." Kenyan Loitarakwai Lengurisi set a new course record of 61:51 on his way to winning last year's Cardiff Half Marathon, and Sunday's course is expected to produce quick times again. With 2016's World Half Marathon bringing yet more global stars to Cardiff, Jones believes the race can raise Wales' profile around the world. "It's going to be a tourist attraction," he says. "I remember people talking about the Ryder Cup at the Celtic Manor and what it would do for Wales. People fly from all over the world to play the 2010 Course there. "After 2016, people are going to fly from all over the world for this race. It's going to be a super-fast race with the best athletes in the world. "Who's to say there won't be in one in Swansea, Wrexham or Rhyl? Cardiff's not exclusive but it's a leader right now, and it's good to see Wales leading."